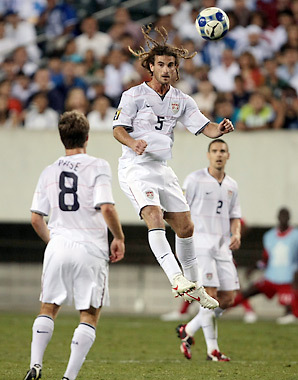 I spoke to Kyle Beckerman recently about his second consecutive call up to the national team. He took the time out of his day, in an airport no less, to give me a call and discuss not only the national team but Real Salt Lake’s season. In speaking with him, it’s little wonder why he is the captain of a resilient RSL squad and why they look to him for steadiness. The stalwart midfielder looks to be breaking into the mold for the national team as well. Here is what he had to say about a myriad of topics. Enjoy. MLS Reserves: How has the season gone thus far for you personally? Kyle Beckerman: "I like to think about it team wise. It’s really been an up and down kind of season. You know, we came out of the gates like gang-busters, right where we left off last year with a chip on our shoulder. We were disappointed with the way it ended and we knew with preseason starting early that we had something to focus on right away." "So the season started off great…then things happened and we kind of took a hit as a team. We’ve taken some bumps after we had that good run in the beginning… we kind of try to get back to it. It’s been kind of difficult. In the four years that I’ve been here I can’t recall a time that it’s been this thin with players out for injuries and Gold Cup, etc. So it’s really been a learning experience for us; something I hope we’ll benefit later in the season from." MLS Reserves: Seeing other teams perform well in the CONCACAF Champions League, do you and the team take pride in that it was RSL who jump-started interest in the tournament? Kyle Beckerman: "Yeah absolutely. It’s neat to see that all these teams are doing well. With us doing it last year, I think it boosted the media and the exposure of the tournament. And now the fans know what’s going on and I really think it’s great to see. We’re definitely proud of it. It’s helping grow soccer in our country and ultimately that’s what we all want; fans, media and us as soccer players." MLS Reserves: We had Nick Rimando on a few weeks back and you talk about growing the game. One of the things we talked about was you guys at RSL having a special relationship with the fans there in Utah. What’s that relationship been like for you? Kyle Beckerman: "Oh it’s been awesome. I came in as…not the favorite guy, haha coming from the rival team in Colorado. I knew that they had a lot of support, even when Real Salt Lake wasn’t doing so hot, they believed in the team. They support the team through the thick and the thin, so when I first got here that was one of the main things I wanted to do: to show them the desire and fight in me to get them on my side." "Once I was able to do that, it’s a lot of fun to give them a good team to be proud of. SO that’s what we’ve been working for since I got here. They expect a lot from us and we’ve set the bar pretty high. You know, we’ve always thought that if we have the stadium and they support us the way we do that they deserves a good team. So we raise the bar and hold ourselves to a high standard for them. That’s what they deserve." 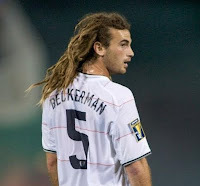 Kyle Beckerman: "When I wasn’t called in it’s not that I’m not a good player. It’s all about preference. Everybody is good at that level. It comes down to preference of the coach. With the last coach I wasn’t his preference and so far I’ve been a preference of Jurgen. I think that’s all that is. I think that there are a lot of good players and it’s whoever connects with what the coach is looking for, they’ll get that shot. I’m just trying to take full advantage of it." "I’ve felt that the door has been kind of closed for me for the past five years or so and I’m just trying to take full advantage." MLS Reserves: Is there a specific role that Jurgen Klinsmann has you playing? Obviously central midfield, but is there a specific job that you are to do? Kyle Beckerman: "Well in the last game [Mexico] we were really concerned with what they’re withdrawn forwards could do. They kind of like to get into those little holes behind and so my job was to kind of shadow our back four. To stay in front of them and give them a little cushion when they’re forwards drop to the midfield…to distribute a bit and disrupt they’re run of play." "I try to do whatever any coach tells me to do. Be it national team or club team, I try to do it the best I can and give it the full effort. I just want to help the team. That’s my job." MLS Reserves: Is there anything that you have to do to prepare yourself for the travel? Kyle Beckerman: "Haha, well it’s going to be extra important to take care of my body this week and a lot of players hate it but the cold tub is magic. It really is. So ten minutes in the cold tub and it makes your legs feel a ton better. You know it’s for the national team so whatever I’ve got to do I’ll push through any tiredness or fatigue no problem. You never know how many games you’ll get with the national team so I’ll be ready for whatever is asked of me." MLS Reserves: What are your future aspirations as a player? Be it with the national team or Real Salt Lake. Kyle Beckerman: "I just want to continue to get better each day. Even though I’m 29 now I want to continue to improve and learn new things. I want to get this team to another championship. We had a lot of fun getting there the first time and we want to it again. I hope to continue to stay in the national team’s plans. I’ll just continue to try and do well when I’m called upon and be ready for any chance that comes my way." We thank Kyle for his time and look forward to seeing him represent the United State’s. The USA will play Costa Rica (Sep. 2) and Belgium (Sep 6). Upwards and Onwards. great interview!!! We love Kyle here in Salt Lake and it's about time the world fell in love with him too! He's an awesome guy...it's about time he get some world soccer cred!! One of the hardest working midfielders in the MLS! Thank you Tash! Appreciate the comment (we dont get a lot). I could tell just from his tone of voice and inflections how much he cares about RSL and his play.